- Reductien in filtration, washing and discharge times. - Reduction of wash liquid consumption due to more homogenous cake. 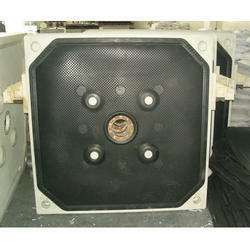 We manufacture Filter Plates in varied sizes ranging from 18x18 up to 48x48 (1200mmx1200mm). Modern filter presses require a square shape filter. For the accumulation of huge quantities of solids, plate filters may be fitted with wide and empty frames. Many presses have both types of filtering. 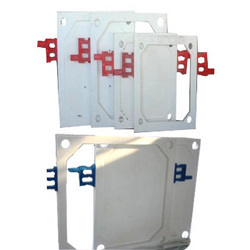 The extrusion membrane plate serves the same purposes as a normal "free" membrane plate, but it is designed to fit into an extrusion to enable a sliding fit for tensioning. Smaller canopies use very simple plate details whereas larger canopies are likely to need additional supporting structure to prevent the membrane plate from pulling out of the extrusion. To cater the variegated needs of our esteemed customers, we are highly engaged in offering a wide array of Rubber Membrane Filter Plate. Price: Rs 50000 to Rs 5000000 as per size, design and quality. With the help of our professionals, we have been able to design an exquisite Membrane Plate. Provided plate is manufactured using superior quality raw material and ultra-modern technology at our well-furnished manufacturing unit. Offered plate is precisely checked by our quality examiners to assure its premium quality. Because of its simplicity and flexibility, the chamber Filter Press has been widely applied in clarification and dewatering applications. Membrane Filter Press technology is gaining increased acceptance because it reduces subsequent processing or disposal costs for filter cake.